A marvelous debut novel about love and basketball, time travel and rock'n'roll. 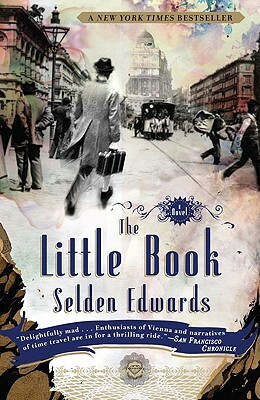 Thirty years in the writing, Selden Edwards' dazzling first novel is an irresistible triumph of the imagination. Wheeler Burden-banking heir, philosopher, student of history, legend's son, rock idol, writer, lover, recluse, half-Jew, and Harvard baseball hero-one day finds himself wandering not in his hometown of San Francisco in 1988 but in a city and time he knows mysteriously well: Vienna, 1897. Before long, Wheeler acquires a mentor in Sigmund Freud, a bitter rival, a powerful crush on a luminous young woman, and encounters everyone from an eight-year-old Adolf Hitler to Mark Twain as well as the young members of his own family. Solving the riddle of Wheeler's dislocation in time will ultimately reveal nothing short of one eccentric family's unrivaled impact upon the course of human history. Edwards brilliantly weaves romance, art, sci-fi, history, and culture in this unforgettable debut novel. A great YA read for those looking for a true adventure! "A soaring thing of joy whose only purpose-and I mean this as a compliment-is to delight and entertain." "Delightfully mad. . .a thrilling adventure." "The product of a writer in full command of his gifts." "A wide-ranging novel of grand ideas. . .a graceful waltz of a book, spinning at times at dizzying speed, but leaving behind a haunting, unforgettable melody." "Back to the Future for the intellectual set." "Inventive, bracing, poignant and well written. . . it should be at the top of everyone's summer reading list." "It's hard not to be thoroughly taken with such an approach to both the real and imagined past." We learn at the beginning of The Little Book that the story will be narrated by Flora Zimmerman Burden, the mother of Wheeler Burden. Why did the author choose Flora to fill the role of narrator? How might the book be different if Wheeler told the story in the first person? Before reading The Little Book, what did you know about the fin de siècle period of European history? What are some of the things you've learned? Why do you think the author chose to portray this era in the novel? In Chapter 3, Arnauld Esterhazy says, "If you understand fin de siècle Vienna . . . you understand modern history." In what ways is his statement accurate? Discuss the first and surnames of the book's major characters. Is it significant that Wheeler adopted his first name from his childhood nickname in baseball? Or that he assumed the name "Harry Truman" in Vienna? What literal "burdens" are carried by each of the Burden men? Discuss the female characters in The Little Book. What impact did the women in his life have on Wheeler? Compare and contrast figures such as Wheeler's mother, Flora, and his grandmother, Weezie (Eleanor). What do they have in common? Throughout the book, the narrator notes seemingly innocuous conversations or events that later prove to be momentous. What did you think of this plot device? Did it enhance your reading experience, or would you have preferred these plot points to reveal themselves more organically? Consider the role of books in The Little Book. Why is the recording of history—such as the writing of Esterhazy's "Random Notes," Wheeler's journal, Weezie's letter to Flora, or other examples—such an important task? While in Vienna and in need of money, Wheeler could have chosen a variety of ways to make a fortune given his intimate knowledge of the future. But he chooses to create a Frisbee—why? How did it prove to be a noteworthy invention? "There is something I know about you. You have never finished things in your life. You have been to great heights and you come to the brink of great accomplishment and fulfillment. And then you have always walked away." Consider Weezie's assessment of Wheeler. What are examples of him walking away from an accomplishment? Why did he do it? Can you think of something he saw through to completion? "She's going to be a damned Cassandra. To know the future and to be powerless to do anything about it. . . . " After reading Wheeler's journal and discovering what would happen in her future, why do you think Weezie continued on her predeter-mined path through her life, when she had the knowledge to change it? Talk about the great love affairs of the novel, like those of Dilly and Flora, modern Wheeler and Joan, and Vienna Wheeler and Weezie. What are parallels between some of these pairings? In Chapter 25, Dilly admonishes Wheeler: "One slip could ruin everything. One errant word could do irreparable ruin to the future we need to be born into." What are some examples of Wheeler intervening in history? Did he alter its course? The characters of The Little Book are connected through many unexpected twists in the book's plot, most taking place across centuries. Were you surprised by the ways the author resolved the story's many plotlines? Specifically, what did you think of the book's ending, when the identity of Wheeler's San Francisco assailant was revealed? Did you suspect who it really was? We learn that Wheeler's parentage isn't as clear-cut as expected. What did you make of this revelation? Did it surprise you or did you expect that it might be true? "You were the hero, I was the eccentric, but don't you see, it was the same thing. We both thought we could change the world around us. We both had the same curse." Talk about the idea of "hero" and "legend," two words that are often used to describe Dilly but that also apply to Wheeler. What does it mean to be a hero or a legend? How are Dilly and Wheeler similar in this regard? Sigmund Freud plays an important role in the story. Talk about his influence, and the influence of his thought, on Wheeler, Weezie, and other characters: What role did he fulfill for them? Address the following question, posed by young Arnauld Esterhazy to Wheeler: " 'I don't understand it,' he said earnestly, 'but anti-Semitism seems to be the driving force of a whole cultural movement. Where does it come from?'" How does the rampant hostility against Jews in fin de siècle Vienna manifest itself in the characters' lives? Specifically, how does it affect Wheeler, and to what end? Late in the book, we learn that Dilly willed himself to 1897 Vienna so he could kill young Adolf Hitler and therefore prevent World War II from beginning. What brought Wheeler to Vienna? If you had the opportunity to go back in time, what period of history would you choose to live in? Would you intend to alter history's course? Why or why not? At the end of Chapter 51, Dilly states: "I am not going to contaminate destiny." Wheeler responds, "Things are already contaminated. We might as well enjoy ourselves." Whose opinion do you agree with in this argument? Did one side ultimately win out? According to his author's note, Selden Edwards has spent more than thirty years writing this book. Talk about the meaning of "life's work": Do you know anyone who has spent decades on a life project of some kind? Which characters in the novel have also spent their lives focused on one goal, and to what end?